A poster for the Holloman Air and Space Expo, which runs Oct. 27-28, 2007. Look up,but also look around. The latest in military aviation and private rocketentrepreneurship is being readied for flight later this month at the upcomingHolloman Air & Space Expo in Alamogordo, New Mexico – a tour de force ofaerospace technology staged in collaboration with the Wirefly X Prize Cup. Along withhigh-flying aircraft and rocketry, the October 27-28 expo will be a ground andeye-level treat for those visiting the show. On display will be a uniquecollection of hardware that affords those attending a look at both governmentalair prowess and private spaceflight initiatives. "Thisyear's Cup is literally an order of magnitude more exciting than last year,"explained X Prize founder, Peter Diamandis. 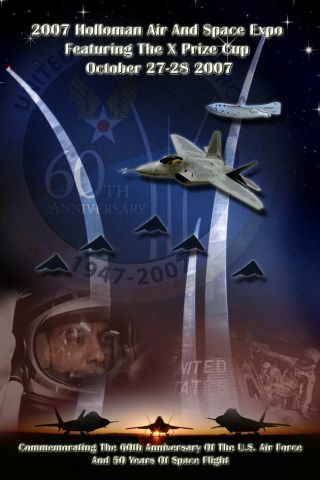 "We've moved the venue from Las Cruces Airport to the HollomanAir Force Base and are expecting 60,000 to 80,000 to attend compared tolast year's 12,000 attendees," he told SPACE.com. For theaviation side of the venue, it's going to be top-flight, Diamandis added. "Wealso are bringing the Air Force's coolest and highest-tech flying machines tothis party," he said, pointing out that Holloman is the home of theF22-Raptor, the most incredible flying machine in America's arsenal, as well asthe F-117 stealth fighter. On thesightseeing manifest for expo visitors are displays and exhibits by key,leading-edge enterprises, such as Rocketplane Kistler, XCOR Aerospace andStarchaser, alongside Northrop Grummanand NASA. Spaceadvocacy groups such as the National Space Society, the Space FrontierFoundation's Teachers in Space initiative and the Students for the Explorationand Development of Space are to be on-hand. So too are several space-orientedmuseums and institutes, including the Robotics Society of America and expertsfrom the Stratospheric Observatory for Infrared Astronomy. At theexpo, those taking part will be treated to a full-scale replica of SpaceShipOne – the pioneering vessel that was the first private piloted spacecraft to exceedan altitude of 328,000 feet twice within a 14-day period in 2004, claiming the$10 million dollar Ansari X Prize purse. Moon andMars rovers and landers are to be featured. Mock-up hardware related to NASA'spost-space shuttle Constellation program are to be on hand too. Sure toattract a cue of onlookers is the engineering model of the Dragon spacecraft,now under fabrication by SpaceExploration Technologies Corporation (SpaceX) of El Segundo, California. The SpaceXDragon design consists of a pressurized capsule and unpressurized trunk usedfor Earth-to-low-Earth-orbit transport of pressurized cargo, unpressurizedcargo, and/or crew members. Dragon was initiated internally by SpaceX in 2005and is to be utilized by the firm to fulfill its NASA Commercial OrbitalTransportation Services (COTS) contract for demonstration of cargo re-supply ofthe International Space Station. "Dragonis the spacecraft that, together with the Falcon 9 rocket booster, will replacethe space shuttle after 2010," explains Elon Musk, chief rocketeer andentrepreneurial leader of SpaceX. The item ondisplay at the expo is the structural and manufacturing test unit of Dragon,minus such equipment as the engines, parachute, and avionics. The first flightunit, which will have those components, is due to be completed in mid-2008,Musk told SPACE.com. Yet anotherexpo exhibitor is the Rocket Racing League (RRL). As an aerospace sports andentertainment organization, the group combines the competition of racing withthe excitement of rocketry. The RRL wasestablished by X Prize founder, Diamandis, and two-time Indianapolis 500champion team partner, Granger Whitelaw. That match of talent is designed toadvance the technology and increase public awareness of space travel. When fullyup and operating, the Rocket Racing League will feature rocket-powered aircraftflown by top pilots through a "three-dimensional track way" at venuesaround the world. Ready tohit the road and head for Holloman? From 10 a.m.to 5 p.m. each day on October 27-28, Holloman Air Force Base will stage theHolloman Air & Space Expo. In partnership with the Wirefly X Prize Cup, theair and space festival is a free event comprising more than twenty differentaircraft displays and space-related events. The AirForce Base is situated in New Mexico's Tularosa Basin between the Sacramento and San Andreas mountain ranges. The base is about 10 miles west of Alamogordo, New Mexico, on route 70/82; 90 miles north of El Paso, Texas; 70 miles east of Las Cruces, New Mexico.